Join us at the EHDI 2019 Annual Meeting, March 3 – 5, in Chicago, IL. Visit our Vivosonic booth (#33) and see the latest version of our Integrity™ V500 System. Voted “Most Likely to Invent Something” by his graduating audiology class, Bill Campbell has been involved in eAudiology since 2008. 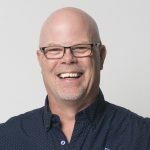 As a Regional Program Coordinator and audiologist for the Ontario Infant Hearing Program in Thunder Bay, Ontario, Canada since 2001, he has worked to improve access to audiology services in remote northern Canadian communities by removing barriers through eAudiology. His efforts resulted in the inception of the first clinical remote infant ABR services internationally. He has collaborated with NCHAM to develop a Resource Guide for teleaudiology, and has worked with other organizations to develop their infant teleaudiology and related training program. Having recently transitioned from a successful private practice to consulting, Bill is currently focused on protocol development and training for remote infant ABR assessment, as well as expanding eAudiology services to specialized CMV treatment centers. He is an active member of Phonak’s “expert circle” for eAudiology awareness contributing to eAudiology: Shifting from Theory to Practice. A member of the Canadian Infant Hearing Task Force, he advocates for national infant hearing programming. 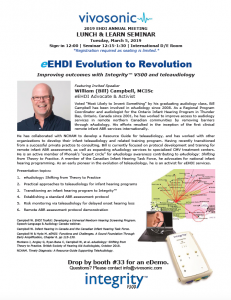 As an early pioneer in the evolution of teleaudiology, he is an activist for eEHDI services. Campbell W. EHDI Toolkit: Developing a Universal Newborn Hearing Screening Program. Speech-Language & Audiology Canada webinar. Campbell W. Infant Hearing in Canada and the Canadian Infant Hearing Task Force. Campbell W & Hyde M. eEHDI: Functions and Challenges. A Sound Foundation Through Early Amplification, Chapter 6. pp 115-130. Montano J, Angley G, Ryan-Bane C, Campbell W, et al. eAudiology: Shifting from Theory to Practice. British Society of Hearing Aid Audiologists, October 2018. NCHAM. Timely Diagnosis: A Resource Guide Supporting TeleAudiology.